A well-worn conservative mantra says picking winners and losers is anathema. Trump apparently hasn't gotten the memo. Picking coal is picking a loser. What does that make Trump? Photo ops won't get you back to the future. In the letters to state BLM offices obtained through FOIA requests, coal companies admitted that the future is not as rosy as they might have hoped or would like to project. Arch Coal, the second-largest supplier in the United States, referred to the “continued downward pressure on the Powder River Basin and subsequent reduced output over the past seven years” in explaining why it was withdrawing a lease application for a major new mine in Wyoming. Rhino Energy, which has operations in Appalachia and the West , said that “current coal market conditions remain depressed” and that it wouldn’t move forward with a lease for a proposed 14,000-acre mine in Colorado until that outlook changed. Cloud Peak Energy, with operations confined to the Powder River Basin, asked the government to reconfigure a proposed lease because it was “simply too large for current market conditions.” And Kiewit, a Fortune 500 contractor and mining company based in Omaha, withdrew its applications for two new mines in Wyoming after waiting for years in the hope that market conditions would improve. 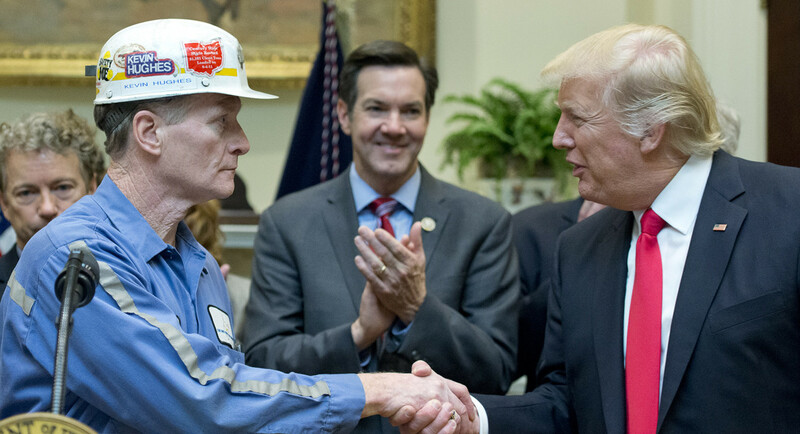 Trump is playing his usual game here, which is to craft, with crude bluster, a message loud and clear, that he's going to make America manufacturing great again by going back to a golden past where women were barefoot and pregnant and men had black lung and died at 59. His base might cheer him at rallies for that, but the coal executives in the boardroom have already moved on. Why? They make business decisions, not messages for their base. Their base is their stockholders, who want profits, not proclamations. Hey, Trump it's time you noticed. The coal industry is declining in two ways. First, as an industry it continues to trend down, and second, it's saying thanks, but no thanks.